Thanks to a tip from Italian Front scout Davide Mana, I picked up the first Dark Horse Conan Omnibus for $2 on Monday. The first story is Born on a Battlefield, depicting the Cimmerian’s youth. The art is by Greg Ruth and I like it very much. Ruth also illustrated the Ethan Hawke Apache Wars graphic novel, Indeh, which was a disappointment — but not because of the art. I liked that very much, too. The world knows Jack London as a writer who lived his own thrilling, real life adventures. But there are parts of his life that have remained hidden for many years — things so horrifying even he couldn’t set them down in writing. These are the secret journeys of Jack London. We meet Jack at age seventeen, following thousands of men and women into the Yukon Territory in search of gold. 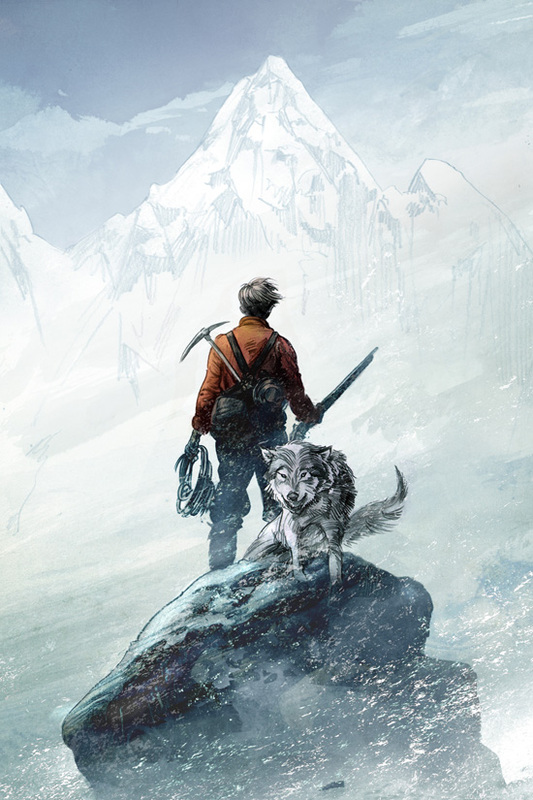 For Jack, the journey holds the promise of another kind of fortune: challenge and adventure. 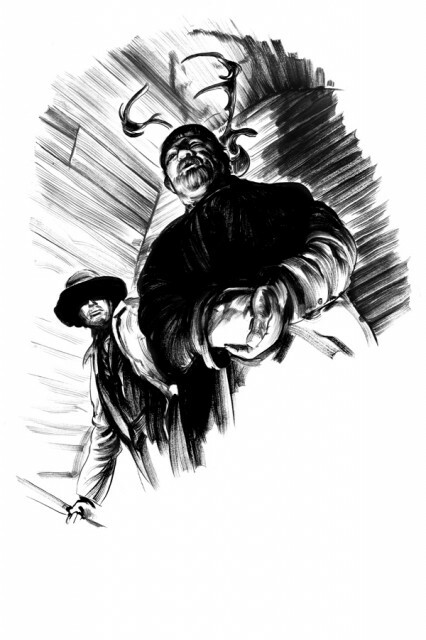 But what he finds in the wild north is something far more sinister than he could have ever imagined: kidnapping and slavery, the murderous nature of desperate men, and, amid it all, supernatural beasts of the wilderness that prey upon the weakness in men’s hearts. I’ve gone on a couple of extended Jack London binges. 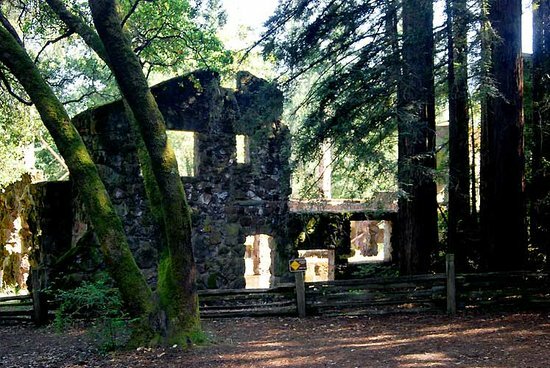 I visited the ruins of Wolf House and a number of other London-related sites in the Bay Area when I was living there. Truly a fascinating, troubled and troublesome man. The Wolf House ruins — I spent hours in this fantastical setting. 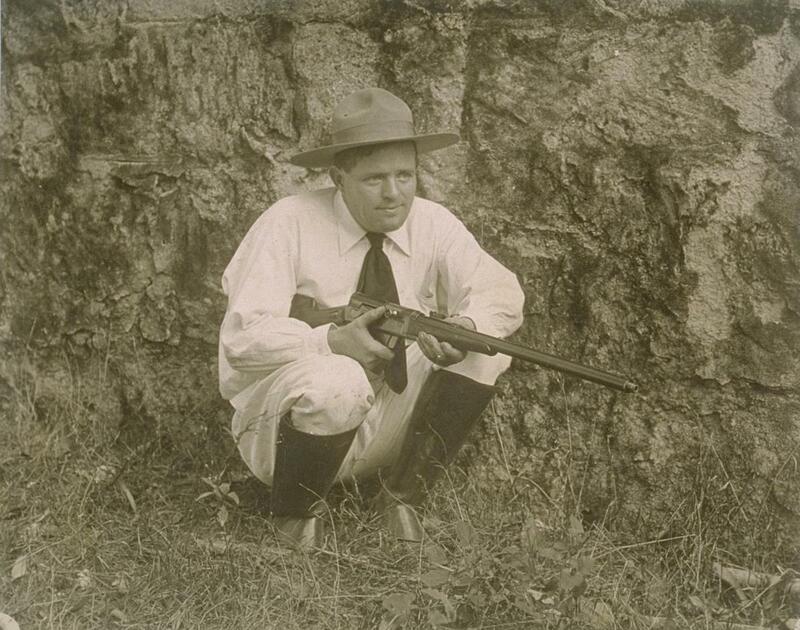 Jack London in a Montana Peak Stetson with a Remington Model 8. The very image of the modern Frontier Partisan. There was a tv series called (I believe) The Secret Adventures of Jules Verne which had similar premise. Jules Verne had secret adventures that inspired his writing. I believe Chris and Tim came up with that concept in a bar conversation, if I’m recalling the story correctly. 🙂 Or wherever it was — it was one of those off-the-cuff chats and next thing you know — books are being written. That is most pleasing. You know those guys, eh? I remember your preview of Indeh, and would like to know more about your disappointment. I have the Earle Labor book on London and man what a tortured life that man had. Lahti whom I mentioned before has a twitter feed full of the things you touch on. It features some stuff by Karl Jacoby who is also very strong on “borders” and “passing”. (and the author of a ripper little work on Camp Grant). But you are on a roll Jim, good stuff! Disappointment was the usual — too much victimology. Yeah, I’m interested in your disappointment in the Ethan Hawke Apache book too–I’d planned to eventually get it, but haven’t yet…. But on the subject of Jack London’s lesser known adventures–that are NOT fictional, I have one of his books on his aquatic travels in the Pacific, and hobb-nobbing with cannibal islanders that is OF COURSE quite interesting! Some great old(if staged) photos too….. And NO QUESTION Jack London’s stories(especially of the North and his dog and wolf-dog characters) had an enormous influence on me growing up–ending up as I did raising and training numerous sled dogs(including some that were part wolf!) to the harness. And I may not be quite done with that “phase” even now–with that recently acquired stray Siberian husky that ended up MINE, needing some training and activity and(dare I say it?) teammates…..
somewhat sentimental, but hey so what if The Apaches get a leg up. Visually stunning, great use of perspective, more Eisner than Giraud. London in the Pacific, yeez Louise, the diseases alone, would have killed any other mere mortal! It’s great all the stuff we’ve had mentioned lately about early influences, books, TV series etc. the public discourse is increasingly stupefying. Have you had a chance to look into; “The Original American Dogs DNA Lives On In A Tumor”? Re: Indeh, You sum up its failings well. Glad I got one thing right! I thought it assumed a high level of knowledge on the part of the reader. I had just read “Once They Moved Like the Wind” and I remember thinking that I would have been pretty lost without having read that book. If you want to read about another frontier wanderer then I suggest the poetry of Robert Service. A Canadian who lived at the time of the Yukon gold rush and during the First WW. In fact he saw service as an ambulance driver in the B.E.F. My father-in-law could recite “The Cremation of Sam McGee” from memory. Love his stuff. Slaid Cleaves ‘ song “Breakfast in Hell” is very much in the Service tradition. Hark to the gray old ram! Jack knew his fire arms, I like his Model 8, a fantastic early (1901) automatic rifle, used in limited numbers by the French Air Force and the favorite rifle of Frank Hamer. And it also saw some use in the Mexican revolution. Wonder what happened to Jack’s Remington? London’s novel “Martin Eden” contains some autobiographical material, I suspect, although it is not one of his famous works. London’s widow is a character in a nifty novel by Loren Estelman that features Charley Siringo and Dashiel Hammett as the main characters. That Estelman novel was titled, Ragtime Cowboys.